Franz Joseph Haydn. Very Good. In very good packaging. Haydn: London Symphonies, Vol.1. Franz Joseph Haydn. Fine. In fine packaging. 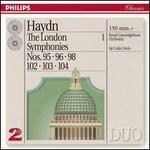 Haydn: London Symphonies, Vol.1. Originally released: 1994. 2 discs. Early issue, lovely condition (made in Germany by Universal). Haydn's twelve London Symphonies represent the culmination of Haydn's long and slow development as a symphonist. They remain among the greatest most varied set of symphonies ever written. Haydn composed them in two sets of six, for two lengthy trips to London in 1791 --1792 and 1794 -- 1795. The symphonies have been recorded in their entirety by many conductors, but the set by Sir Colin Davis conducting the Royal Concertgebouw Orchestra is justly renowned. Davis's readings are available on two two-CD sets from Phillips, each of which sell at a modest price. There is no better way for the newcomer to get to know Haydn's masterworks. The first of the Phillips volumes, which I discuss here includes three of the earlier symphonies of the group, nos. 95,96, and 98, together with the magisterial final three symphonies, nos 102, 103, and 104. Haydn's music speaks to the beginner in music (Remember the slow movement of the "surprise" symphony, known to every child.) as well as to the most demanding listener. The London audience for which he wrote them consisted both of people who knew little of music together with highly knowledgeable and sophisticated music lovers. Haydn had the ability to please both. The London symphonies are full of memorable and simple tunes, concertante solos for many instruments, jokes, and gimmicks. But they also include great musical variety, highly original slow introductions which become deeply integrated with the body of the work, deep slow movements, great development of material, creative orchestration, and extensive use of counterpoint. The symphonies have best been described as exemplifying a "sense of grandeur". They are large-scale, serious compositions, full of ease and mastery. They are also very much products of the Enlightenment as they move from their slow and mysterious openings through to their lively, positive, and triumphant conclusions. The earliest of the London symphonies is the Symphony no. 96 in D major sometimes called the "Miracle". This is a simpler work than most of its companions. It opens with a fanfare slow introduction followed by a lively theme. Moments to listen for include the oboe solos at the end of the introduction and in the trio of the third movement, the counterpoint in the minor key in the slow movement, and the solos for flute and violin near the end of the slow movement. The symphony no 95 in C minor is the only one of the London symphonies in a minor key and the only one without a slow introduction. It juxtaposes major and minor key elements coming to a major, triumphal close in the first movement. The first movement consists of an angular, angry minor key opening theme, followed by a long, lyrical theme in a major key. The second movement is a theme and variation while the minuet returns to the minor. The solo cello has large roles in the two middle movement. The finale is in the major with a great deal of fugal writing. The final three symphonies of the "London" set are large-scaled masterpieces, the summit of the series. They were written for performance at the Opera Hall; and Haydn took full advantage of the orchestra and acoustics available to him to say his last word in symphonic form. There is much to hear and rehear in these symphonies. The symphony no. 102 in B flat major opens with a slow, largo introduction for the strings followed by a fast movement with two contrasting themes and a large-scaled development. The second movement is probably Haydn's best, as it glows with feeling and romance. The finale is a perpetuum mobile, developed canonically, with a theme that is tossed continually among the various instruments of the orchestra. The "Drum-roll" symphony no. 103, opens with the instrument for which it is named followed by a growling introduction in the lower strings. In many ways, this symphony is similar to Haydn's Oratorio, "The Creation", composed subsequent to the London symphonies, with its movement from darkness to light. Unusually, the opening introductory material returns at the conclusion of the first movement. In the minuet of this symphony, Haydn moves from some simple, rustic writing for woodwinds to an immediately following theme for the violins of great urbanity. Haydn develops his final movement from some simple material, which he uses contrapuntally and with variety. With its combination of depth, sophistication, wit, and highest mastery, the London symphony, in D major, No. 104, is my favorite of the set. It is a large work which begins with a minor-key and solemn introduction followed by an unusually lively and triumphant opening allegro. The slow movement is song-like with a darker middle section in the minor key. The minuet again features solos for winds in the trio, but the highlight of this symphony is its finale. Over a continuous drone, the orchestra articulates a theme, possibly derived from an English street tune, and develops it thoroughly from wit to grandeur. It is an apt conclusion to Haydn's symphonic career. This is a set that can be heard many times, with increasing pleasure and discovery. Haydn's London Symphonies are among music's lasting joys. They are beautifully performed by Sir Colin Davis and the Amsterdam Concertgebouw.